Home Freeze Cool FM Abandons Wife for Older PH Lover? 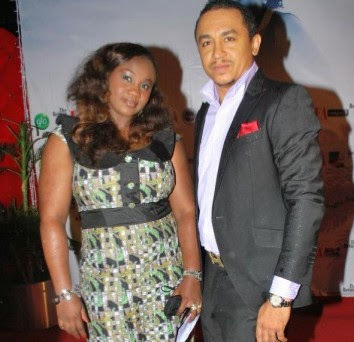 Freeze Cool FM Abandons Wife for Older PH Lover? Freeze Cool FM Abandons Wife for Older PH Lover? “You called to ask about the challenges in my marriage? Do you have work? Common!” When reminded that by calling him, we were doing our work, and professionally too, he said: “Why can’t you talk about national issues? I think you should concern yourself more as a fellow journalist on finding out where the girls are. That’s Bring Back Our Girls. Go and face that one. There is nothing wrong. Okay! Everything is okay. Alright! I don’t discuss my family as a matter of principle. Good or bad, I do not discuss my family. Thank you”. But his denial notwithstanding, sources close to him insist that not only is his marriage threatened, he’s since abandoned his wife and children, preferring instead the company of an older lover in PH who is said to be a mother of four. Some of his friends have waded in, trying to get him to return to his family and straighten things up with his wife to no avail. Also, his pastor, Paul Adefarasin of the House On The Rock, has equally intervened. Yet a truce has not been reached. He was said to be in year two when his path and that of his wife, then a Jambite, crossed at UI. Now, the unabashed collector of expensive timepieces and his love are unfortunately having challenges with their union. And a serious one at that. Tags # Freeze Cool FM Abandons Wife for Older PH Lover? 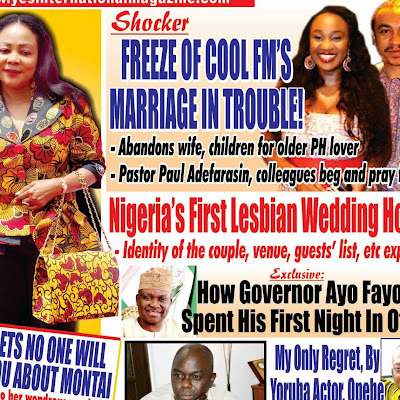 Labels: Freeze Cool FM Abandons Wife for Older PH Lover?